Trump calls for end to 'revenge' politics at State of Union - SABC News - Breaking news, special reports, world, business, sport coverage of all South African current events. Africa's news leader. 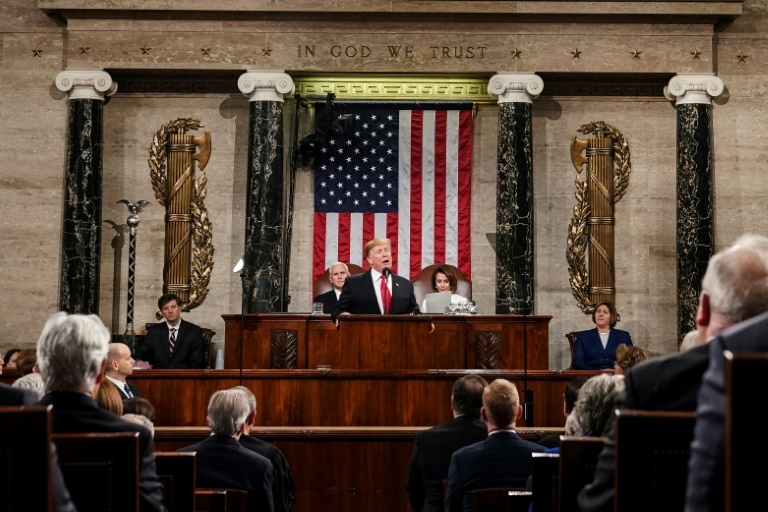 US President Donald Trump appealed to Congress Tuesday to unite at a moment of deep partisan division as he made the case for a new era of compromise on immigration and security in his State of the Union address. “We can make our communities safer, our families stronger, our culture richer, our faith deeper, and our middle class bigger and more prosperous than ever before,” Trump said. It was the president’s first speech in the House since the Democrats took the lower chamber back in a landslide last year — leaving Congress split with Trump’s Republicans still in control of the Senate. He was cheered repeatedly by his side during the speech, which lasted around 85 minutes, but was met with stony silence from the Democrats, led by House Speaker Nancy Pelosi, as he turned to the thorny subject of immigration. Vowing to get his disputed border wall built despite opposition by Democratic lawmakers, he urged Congress to “work together” and forge a deal to improve border security. “In the past, most of the people in this room voted for a wall — but the proper wall never got built. I’ll get it built,” he said, referring to lawmakers from both political parties who he repeatedly stresses voted for physical barriers in previous years. Trump’s speech came ahead of a February 15 deadline for Congress to agree on funding for building a border wall which the president made a key pledge in his election campaign. Democrats, who control the lower house, have repeatedly rejected Trump’s funding demands, saying that he has made the wall project a political crusade to demonize immigrants and to satisfy his base. Trump previously tried to pressure Congress into backing his idea by refusing to sign off on budgets for swathes of the federal government, leading to a five-week shutdown of some 800,000 government jobs. “Simply put, walls work and walls save lives. So let’s work together, compromise, and reach a deal that will truly make America safe,” Trump added. Trump’s second State of the Union address came with the Democrats vowing to use their new control over House committees to launch multiple investigations into everything from his charity foundation and tax returns to possible collusion with Russian meddling in the 2016 election. “An economic miracle is taking place in the United States, and the only thing that can stop it are foolish wars, politics, or ridiculous partisan investigations,” Trump said. This entry was posted on 06 Feb 2019,05:37AM at 5:37 AM and is filed under World, Homepage Featured Story Slider. You can follow any responses to this entry through the RSS 2.0 feed. Both comments and pings are currently closed.